The Schreiber Center Grand Opening Celebration featured several special guests. General Colin L. Powell, USA (Ret. ), gave the keynote remarks, and Chicago Mayor Rahm Emanuel offered his congratulations. All told, the event has raised a net total of $390,000 to support Quinlan and its students. “The mission of our University, transforming students into men and women for others in the great Jesuit tradition, would not be possible without leadership from deans like Kevin Stevens, our expert and dedicated faculty, or the support of generous investors,” said John P. Pelissero, PhD, Loyola’s interim president. The future begins at the Schreiber Center. Watch how Quinlan's new home encompasses innovation, community, and sustainability. See why Quinlan honored young alumni Ryane Bohm and Benjamin Korallus with the Emerging Leader Award. Quinlan dean Kevin Stevens welcomed guests to the Grand Opening Celebration by noting that the Schreiber Center “is no ordinary business school building,” as it supports innovative, collaborative, and cutting-edge education for the future’s responsible business leaders. General Powell reflected on what makes a great leader and a great building. 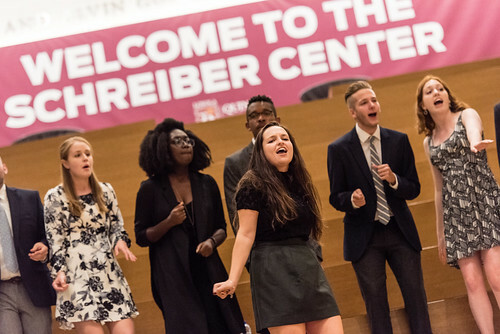 The Grand Opening was part of a full day of celebrations for the Schreiber Center, Quinlan’s new home on Loyola’s downtown campus. Nearly 100 of Chicago’s corporate leaders attended a CEO Summit to discuss corporate social responsibility. Read the story. Among those in attendance at Tuesday evening’s gala were Chicago Mayor Rahm Emanuel and John and Kathy Schreiber. See the pictures.